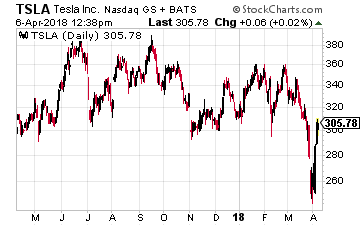 Ask the average investor the biggest beneficiary of the move around the world toward electric vehicles and the likely answer will be Tesla (Nasdaq: TSLA). I only wish I could press a very loud buzzer informing them they are wrong. Tesla is just one ‘horse’ in a very crowded field of automakers. I know that you know better, or else you wouldn’t be reading this right now. Surging demand for the technology metals that I bring to your attention promises to overturn the balance of power between mining companies and their customers. So says the billionaire mining entrepreneur and legend Robert Friedland that I introduced to you in the very first issue of Growth Stock Confidential. I am total agreement with Friedland… electric vehicles are an extremely good long-term growth story for both the technology and industrial metals. Yes, the industrial metal nickel is poised to be a big winner in the electric car revolution. Most people think nickel is just used in the making of stainless steel. But there is one particular form of nickel (more on that later) though that is crucial to the lithium-ion batteries that power electric cars. And while stainless steel still accounts for 85% of nickel consumption and batteries only 3%, demand from battery makers for nickel this year has soared 44% this year. Demand from battery makers is where nickel’s future growth will come from. Nickel has been a terrible investment for the past few years, as it has been weighed down by excess mine supplies and bulging inventories. Nickel collapsed from its high in 2007 of $51,600 a ton to around $8,000 a ton in 2015. Just look at this 15-year chart. This is all about to change and in a major way, thanks to electric vehicles. 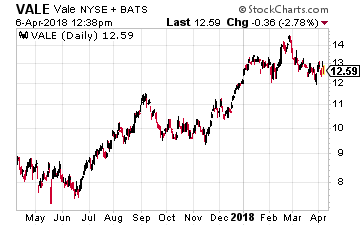 We are already seeing hints of this as in early November nickel had rallied to a two-year high. The excitement is building for nickel among metals industry insiders. In fact, the biggest buzz at this year’s annual LME (London Metal Exchange) week in London in early October was surrounding stodgy nickel. It emerging as one of the favored ways to play the electric vehicle supply chain. The expectation is that nickel-manganese-cobalt batteries may gain a lot of market share because of their ability to allow motorists to drive further on a single charge. Among the topics at the conference was a very conservative forecast for the number of electric vehicles on the road by 2025 is 14.2 million from the consultancy Wood Mackenzie. In 2016, there were 2.4 million electric vehicles on the road. If this happens, Wood Mackenzie forecasts that demand from the auto industry will rise from 40,000 metric tons in 2016 to 220,000 tons in 2025. The global nickel market is only 2.1 million tons in size. And when you consider other components needed by electric cars outside of the battery, the Wood Mackenzie figure climbs to 275,000 tons – 12% of global supply. This is an eye-opening in the light of the fact that nickel inventories are finally shrinking. Most of that is due to high demand coming from China. Estimates are that demand there is up 3.8% to 1.1 million tons through the first 10 months of 2017. Analysts at the investment bank UBS say that there will be a 71,000 ton deficit this year, while others say the nickel deficit is as high as 150,000 tons. Whatever the correct amount of the deficit is, one thing is certain – it is eating into the amount of inventory overhang. Mining companies will just be able to crank up the amount of nickel they mine, so it’s no problem, right? That’s what some Wall Street analysts say that really don’t know what they’re talking about. You see, the majority of nickel production coming onstream through 2025 is of the low-quality variety – ferronickel or nickel pig iron. Both of which cannot supply the much-needed nickel sulphate for electric car batteries. Nickel sulphate is produced by dissolving pure high-grade nickel metal, called Class 1, in sulphuric acid. That is why nickel sulphate prices this year have traded at a premium of up to 35% over the LME price of nickel. To bring home the point about the importance of nickel sulphate, I turned to one of the many contacts I have in the technology metals industry, Simon Moores. He founded Benchmark Mineral Intelligence in the U.K. a few years as a source of information on the technology metals markets. He and his firm have quickly become the source for such information for Bloomberg, CNBC, and all the other financial media outlets. The chief economist at commodities trading firm Trafigura, Saad Rahim, told Bloomberg that demand for nickel sulfate will soar 50% to 3 million metric tons by 2030. Portfolio member Glencore is largely in agreement – it forecast a need to boost nickel output by 1.2 million tons by 2030 in order to meet demand. That is more than half of current global production. And keep in mind that most of this increase in nickel output needs to be of the high-quality ore.
That demand for higher-grade ores is already being reflected in the marketplace. The spread between high-grade and low-grade iron ore has widened to more than $20 a ton this year, from only $5 to $8 a ton 18 months ago. Since only about half the world’s nickel is suitable for batteries, we need to stock to that part of the nickel market with our investment selection. And we want to stick with the major players, not some speculative exploration company. That leaves us with the two largest nickel miners in the world – Russia’s Norilsk Nickel (OTC: NILSY) and Brazil’s Vale SA (NYSE: VALE). You may recall that Vale got into nickel in a big way when it purchased Canada’s Inco in 2006 for C$19 billion. While there are political and geopolitical concerns with both countries, I’m opting for the slightly safer choice and going with Vale. In addition to being a powerhouse in nickel, Vale is the world’s largest producer of iron ore, most of which is of the highest quality. But like its Brazilian peers, Vale was a company in a lot of trouble, not only because of falling commodity prices, but also because of direct interference in its operations from the prior Dilma Rousseff (who was impeached) government. The first step out of the wilderness was taken by Vale in March when it named 63-year old Fabio Schvartsman as its new CEO. He is a commodities industry veteran, having run companies for four decades, with the latest being Brazilian paper giant Klabin. In late June, the first phase of a restructuring plan to reduce government influence was put into place. As part of that process, the plan is to list Vale on Brazil’s Novo Mercado, which has higher corporate governance requirements. But most importantly, Schvartsman is tackling the company’s debt problem. Vale’s debt hit a peak of $25 billion – a lot for a company with a market capitalization of less than $60 billion. He is targeting a halving of Vale’s current debt of about $21.1 billion to less than $10 billion in order to become a “results-orientated” company. Net debt at the end of the third quarter of 2017 came in at $21.066 million, down 18.9% year-over-year. Schvartsman is also ‘running the slide rule’ over all projects. For example, he is looking for a partner to invest in one of the world’s biggest nickel mines, which is located on the remote South Pacific island of New Caledonia. Discussions are underway with a number of possible Chinese partners that are in the battery industry. If he doesn’t fund a partner, Schvartsman will shutter the mine. Now let me show you a closer at Vale’s numbers. The majority of its business – about 75% – is centered around iron ore. Vale operates two world-class integrated systems (the Northern System and the Southern System) in Brazil for mining and distributing iron ore, which consists of mines, railroads, port and terminal facilities. But roughly 20% (and growing) of Vale’s business consists of non-ferrous metals like nickel and copper (it is Brazil’s biggest producer). It is also the country’s sole producer of potash and the world’s third largest producer of kaolin (a clay industrial mineral). The remaining 5% or so are scattered around assets like coal. In a presentation to shareholders in November, Vale said it will unload $1.5 billion worth of non-core assets from 2018 to 2020. I fully expect these positives will continue to boost the company’s results in the quarters ahead. And once you add in the promise of an electric vehicle future for nickel, Vale should make a nice addition to any wealth creation portfolio.